There are two unique donation options now available for you to donate to help Srbadija Folklore offset some of the costs associated with hosting their upcoming “Intercultural Dance Festival” event and you may now make your donation online though the new St. Sava Church Online Bookstore using debit or credit card. You may make your donation for the items listed above paying online with credit or debit card through the new, secure online bookstore (www.saintsava.net/store). You may also continue to donate to Srbadija Folklore by check with option to mail or deliver the check in person to the Church Office. In addition to the two donation options for Srbadija Folklore available in the online bookstore, there are a few other general items in the bookstore that are available for sale in this initial launch of the new online bookstore. More books and other religious items will be added to the new online bookstore in the coming weeks to expand the selection of items available for shipping directly to your door or available for pick-up in the Church Office during regular business hours. If you have questions about Srbadija Folklore or would like more information about making a donation to the group in some other way, please contact Karen Knezic at karen.knezic@saintsava.net. 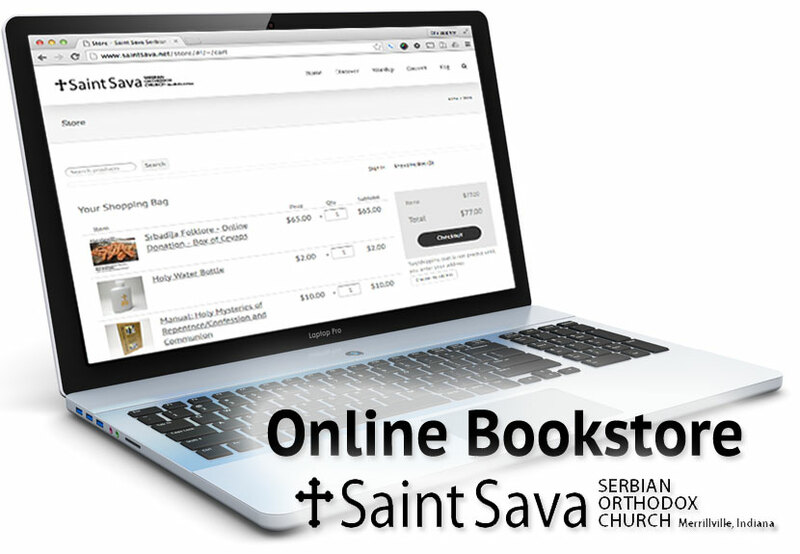 If you have questions about the new online bookstore shopping process, please send e-mail to store@saintsava.net.